Hopefully you've read our Metal Slug Defense Cheats and Tips guide before stepping up your game with this one. 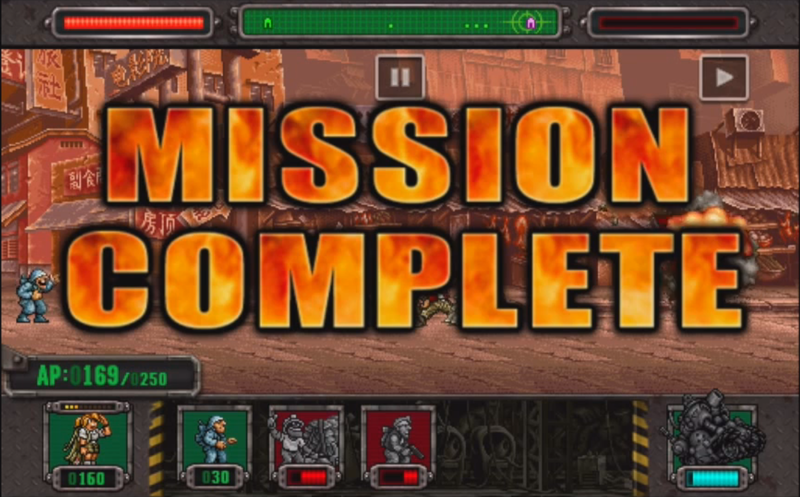 If you haven't, the concept is fairly simple, with the objective in Metal Slug Defense to destroy the enemy base. To do this, it requires that you produce troops by generating Action Points (AP). The game plays similar to Tower Defense with the exception that units need a specific amount of AP for deployment. The quickest way to create AP for various unit types is to repeatedly tap the lower left icon of Rumi Aikawa at the bottom of the screen. Knowledge of each unit's strengths and weaknesses will determine how effective you are as a commander. In this scenario, we've done the homework and provided you with a few tips and strategies to elevate your game. The importance of knowing your troops will multiply your chances of success on the battlefield. Taking into account unit differences like health and action points, standard and special attacks, movement and production speed will factor into what units you deploy for offensive and defensive situations. The strategy comes into play by utilizing various units to create a winning offense to take out the enemy base. A good example of unit knowledge comes into play when you have two units with similar special attacks like Tarmicle Roving III and Fiolina Germi, both use a spread attack to dispatch enemy troops. The difference is that Tarma has a lower AP cost and a higher HP. He offers a faster movement and production speed, which makes it easier for you to quickly dispatch enemies. Fio has a lower HP, movement and production speed, but compensates with power and special attack spread. This makes sense, since a Rocket Launcher would have more reach and power than a shotgun. Knowing these differences in unit abilities will pay dividends on the battlefield, as each situation calls for a particular unit. A good defense is an indication of intelligence. Preparing yourself for the battle to come is sometimes necessary to avoid being overwhelmed. As you may have encountered on the battlefield, you can start at a disadvantage. The enemy may already have a tank or rocket launcher on the battlefield before you've built enough AP for a soldier. Your first reaction should be to create a buffer with the sandbag to buy some time to deploy the appropriate unit. Using the sandbag allows you to deploy troops that take advantage of the cover it provides. Marco, Tarma and Fio utilize cover with the sandbag by not progressing past it until enemy unit before it is dispatched. Unlike the soldier, which follows the order to attack blindly not taking defenses into account. Using the sandbag as a defensive strategy can be quite effective when setting up an offensive wall when preparing a full on attack. We go into more detail about that in our Offensive Units section below. Knowing what offensive units to deploy will win you the game. Setting up the proper offensive strategy goes back to knowing your units and their capabilities. You want to deploy the right combination of troops to deal with the obstacles on the battlefield. Since that's one of the few things in your direct control, you have to be able to read the battlefield and deploy troops to meet your opposition. Your unit's special attacks are key in determining the offensive strategy against the enemy. Each special attack has a specific offensive strategy in helping you destroy the enemy base. The Grenade from your soldier is a great offensive tool to use when you need to clear a path through the weaker enemy troops. This attack should be used prior to Fios' rocket launcher special attack, or Tarmas' shotgun which shoule be reserved for more damage to stronger enemy units. If you're overwhelmed, incorporating the defense strategy to build a stronger offense is a sure way to turn the tide in your favor. Marco, Tarma and Fio utilize the cover of the sandbag to effectively hold off enemies with standard attacks. Deploying these units in that order behind the sandbag enables you to deliver a powerful offensive strategy. By using their special attacks in succession, you create a team that can drive the enemy back towards their base with little opposition. Deploying a sandbag periodically keeps them in cover if there's a build up of enemy units on the board. This strategy will put you on a solid path to taking out the enemy units and ensure your victory on the battlefield. Keeping the pressure on the opposition is the name of the game. Now that you've gotten a few tips on how to properly utilize your units, the next question is, do you have what it takes as a commander to bring your army to victory? You've read this guide and have taken an important first step to becoming a great commander. To effectively put these tips and strategies into action will require practice, patience and a firm grasp of the basic gameplay mechanics which you can find in our Metal Slug Defense Cheats And Tips Guide.